Tiger and leopard are felines belonging to the same family and genus. Though these two big cats are similar in some characteristics, there is a huge difference between the two. One of the striking differences between a Tiger and a leopard, one can come across, is in its outer fur. The tigers have dark vertical stripes on a white or orange background. Instead of the vertical stripes, a leopard comes with spots or rosettes in its fur. One can see a large number of small spots on a leopard’s body. When comparing the size of the two felines, the leopard is smaller to a tiger. When a tiger weighs about 500 pounds, a leopard just weighs 140 pounds. When talking about strength, the tiger has an upper hand over the leopard. The tiger has more powerful legs and shoulders than the leopard. When a tiger stretches 6 feet in length and has a tail length of three foot, the leopard stretches to about 6.25 feet and has a tail length of about 4.5 feet. Unlike the tiger, a leopard is known for its climbing ability. Leopards can be often seen resting in treetops. Though these two felines are known as good swimmers, the tiger is a better swimmer when compared to a leopard. Well, the leopard is highly concentrated in sub-Saharan Africa and are also seen in India, china, Indo-china and Malaysia. 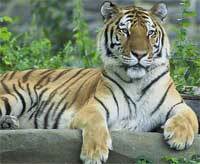 Tiger population is somewhat concentrated in southern and eastern Asia. Leopard was earlier believed to be a hybrid of lion and panther. And thus the name leopard is a mix of Greek words leon (lion) and pardos (panther). Tiger is a word that has also been taken from Greek ‘Tigris’, meaning arrow (reference to a tiger’s speed). 1. The tigers have dark vertical stripes on a white or orange background. Instead of the vertical stripes, a leopard comes with spots or rosettes in its fur. 2. When a tiger weighs about 500 pounds, a leopard just weighs 140 pounds. 3. A leopard is known for its climbing ability. 4. Tiger is a better swimmer when compared to a leopard. 5. When comparing the strength, the tiger has an upper hand over the leopard. The tiger has more powerful legs and shoulders. 6. Leopard is a mix of Greek words leon (lion) and pardos (panther). On the other hand, Tiger is a word that has also been taken from Greek ‘Tigris’, meaning arrow (reference to a tiger’s speed). Prabhat S. "Difference Between Tiger and Leopard." DifferenceBetween.net. December 24, 2009 < http://www.differencebetween.net/science/nature/difference-between-tiger-and-leopard/ >. Very nice article. Gave lot of information. Thanks. This is very useful article. I always confuse when i saw tiger and leopard but till today not. Thank you ever so much. It was very helpful. At 90 I’m expanding my knowledge of my planet. Such a shame I left it for so late. Many of us don’t appreciate our bountiful, beautiful Earth. Channel 13 & folks like you are invaluable. Thank you so much for giving information about diffrence between tiger and leopard. Tigers cannot climb a tree but leopards can.